With a range of 40 feet—that's 25 feet more than a Taser&mdasj;the Avurt IM-5 personal protection launcher will keep away anyone you don't want near you from getting too close. It's simple to work: aim at the chest of a large, blond man in a stadium, pull the trigger and the man will be too overcome by coughing to do anything to you. 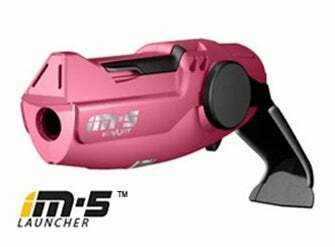 The flashlight-sized IM-5 can shoot up to five pellets containing PAVA powder. When you see the large blond man in the stadium, unfold the weapon and, using the laser bead, take aim and Bam! you bagged yourself a large, coughing mammal.